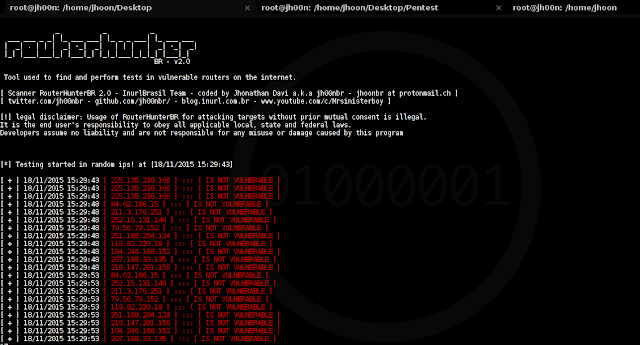 The RouterhunterBR is an automated security tool que finds vulnerabilities and performs tests on routers and vulnerable devices on the Internet. The RouterhunterBR was designed to run over the Internet looking for defined ips tracks or random in order to automatically exploit the vulnerability DNSChanger on home routers. The DNSChanger is a trojan able to direct user requests to illegal sites. In practice, this malware has the ability to change the DNS settings of our machine redirecting the user to sites with malicious purposes. Imagine for example that your system is infected with this malware, what might happen is that the user to access a particular site (eg. Facebook.com) may be forwarded to an unsolicited website and potentially illegal. -bruteforce, --bruteforce                        Performs brute force with users and passwords standards, and soon    after defines the malicious DNS. Brute force with users and passwords on routers that requires authentication, forcing alteration of dns - DSLink 260E.